BAE Systems has received a potential $4.8 billion contract from the U.K. defense ministry to build the first three ships under the country’s Type 26 Global Combat Ship program. The company said Sunday the contract is expected to create at least 3,400 jobs across the U.K. and that it will begin the steel-cutting operation on the first ship in Glasgow, Scotland, in the next few weeks. BAE CEO Charles Woodburn said the contract seeks to reflect its employees’ talent and build up Glasgow as U.K.’s shipbuilding center. Woodburn added that the company is constructing five River-class patrol vessels for the British navy at its shipyards in Glasgow. The U.K. government pledged to purchase eight Type 26 combat ships to replace Type 23 frigates designed to perform anti-submarine warfare operations and support humanitarian missions. The Type 26 supply chain already has 33 companies that are working to deliver the combat vessels. 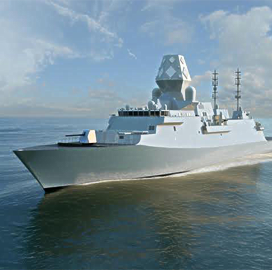 Tags anti-submarine warfare BAE Systems Charles Woodburn Contract Award featured frigate Glasgow govcon River-class patrol vessel Scotland shipbuilding Type 23 Type 26 global combat ship u.k.